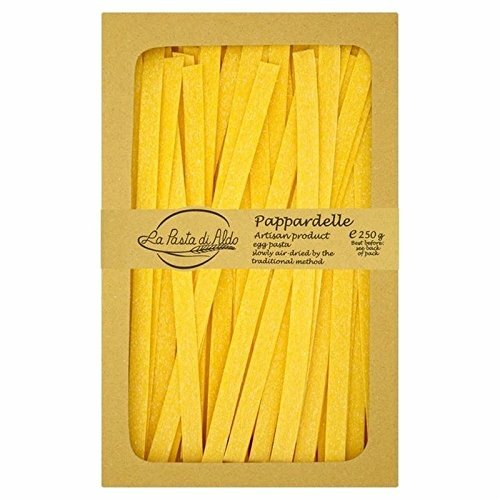 Pasta Di Aldo' is named after the first two letters of each surname of Luigi Donnari and his wife Maria Alzapiedi, who make just 50kg of dried pasta per day from their tiny workshop in Monte San Giusto the Le Marche region of Italy. Using a variety of local wheats for each product, the pasta is hand-kneaded then rolled out on a small machine, cut by hand and then hung to dry slowly in low temperatures for a natural drying process. The final step is packing into fine handmade boxes. The resulting pasta has a rough texture and a bright egg colour, which on eating is light and fragrant. Widely regarded by Italians as one of the best artisan pastas in Italy, it is also endorsed by Heston Blumenthal who has described it in his book 'In Search Of Perfection' as "perhaps the finest pasta in Italy" Pasta Di Aldo' is named after the first two letters of each surname of Luigi Donnari and his wife Maria Alzapiedi, who make just 50kg of dried pasta per day from their tiny workshop in Monte San Guisto the Le Marche region of Italy. Using a variety of local wheats for each product, the pasta is hand -kneaded then rolled out on a small machine, cut by hand and then hung to dry slowly in low temperatures for a natural drying process. The final step is packing into fine handmade boxes. The resulting pasta has a rough texture and a bright egg colour, which on eating is light and fragrant. Widely regarded by Italians as one of the best artisan pastas in Italy, it is also endorsed by Heston Blumenthal who has described it in his book 'In Search Of Perfection' as "perhaps the finest pasta in Italy".